Cynthia Rogers is interested in the stresses a psychotherapist encounters over the course of his or her professional life and how these might be addressed. Running a practice that provides a living is complex in itself, but how do people manage when life events or their own insecurities intrude. Psychotherapists with thriving practices know that, at some stage, they will have to confront a complain, suicide, a bad debt, a lack of referrals or deal with the impact of personal life events. These events are part of the territory and a way has to be found for professionals to take them in their stride however stressful they may be. Psychotherapists traditionally learn from experience and Rogers has distilled her own and others' experience to throw some light on the shadow side of a psychotherapist' s life. Experienced psychotherapists are emerging from the consulting room and becoming supervisors, trainers and consultants. They are also moving between private practice, GP surgeries and the voluntary sector. Rogers describes the demands of each setting and shows how to draw on new parts of one' s self and learn new ways of working at each move. 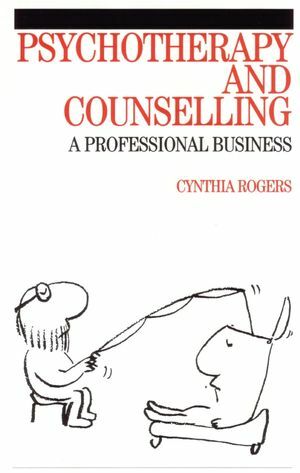 Cynthia Rogers is the author of Psychotherapy and Counselling : A Professional Business, published by Wiley. Events in The Therapist' s Life. What can a Therapist Learn From Business Ideas?.